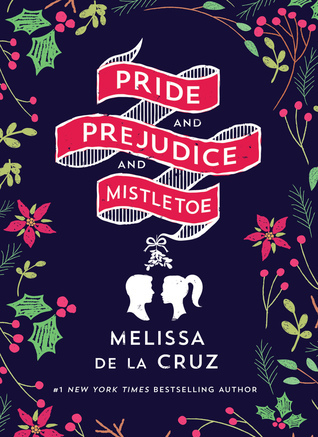 Pride And Prejudice And Mistletoe by Melissa De La Cruz by all rights should probably be my favorite Christmas themed romance of the year. It has this gorgeous cover. The origin story is one that I know and love, only with Darcy and Elizabeth gender swapped. This book just fell kind of really short of my expectations. This Christmas themed version of Pride And Prejudice really follows Darcy Fitzwilliam, a hedge fund manager as she comes home to Pemberley, Ohio following her mother’s heart attack. Darcy currently lives in NYC and has not really been home in years. Back home she butts heads with her next door neighbor, Luke Bennett. Luke is a carpenter and not exactly the same level of wealthy as Darcy. Still, there’s kind of a spark between the two. Meanwhile, Darcy tries to hook up her friend Bingley with Luke’s brother Jim which goes a whole lot better than Darcy’s current situation. Oh, and also Darcy’s on again and off again boyfriend Carl gives her an ultimatum. However, she can’t stop thinking about Luke. Overall, there’s a reason why this book does not have the highest ratings right now. I will say that I went in optimistic and tried not to let that color my view. Unfortunately, this book was just not great. Pride And Prejudice And Mistletoe just really lacked that essence that the Austen original has. I never felt this crackle or tension between Darcy and Luke. There were not any great moments of banter or witty conversation. Probably the highlight of this whole book is the side romance between Jim and Bingley. And like, I felt like Darcy’s character was really softened and it just, wasn’t what I had expected. I probably would have liked it way more if it was its own thing without Pride And Prejudice in the name. On A Scale Of One To Buddy The Elf, How Much Christmas Spirit Does This Book Have? Pride And Prejudice And Mistletoe does indeed contain multiple scenes with mistletoe and kissing. There’s ice skating. There’s caroling. Also, there’s a big Christmas party. And presents! So, actually there are a ton of Christmas-y moments in this book which are slightly redeeming. So, even though it didn’t have the Austen feel I wanted at least it delivered on the mistletoe. Ah, it can be so disappointing when titles just do not live up to expectations. I’d seen this one around, and had also been attracted by the cover and fun synopsis/concept. What a shame… Your objective review is much appreciated April.